Frequent urination can occur due to many different causes. You could experience frequent urination due to urinary incontinence, a bladder infection or interstitial cystitis, a condition involving chronic bladder inflammation. Certain dietary changes may help reduce your frequent urination, but you must consult your doctor to treat the underlying condition and evaluate the safety of following a specific diet. One of the most important types of foods you can add to your diet for frequent urination is fiber, MayoClinic.com says. Eating more fiber can help prevent constipation, which often accompanies frequent urination and urinary incontinence. In addition to fiber, you can add more antioxidant foods like tomatoes, squash and cherries to your diet, advises the University of Maryland Medical Center. 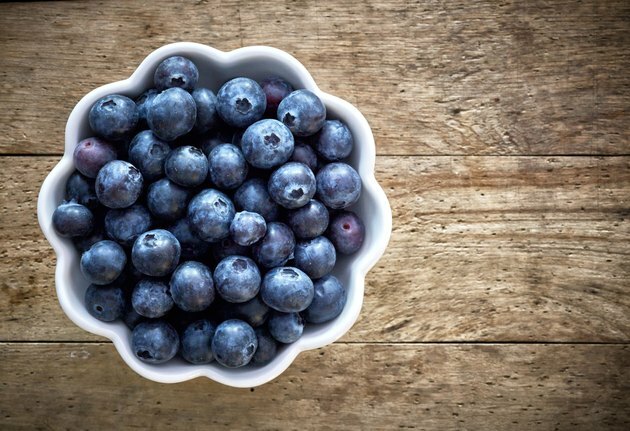 Blueberries and cranberries can help prevent urinary tract infections. Also, add more magnesium-rich, low-calcium foods like brown rice, barley, bananas and potatoes to your diet to help reduce frequent urination. If you suffer from frequent urination, you might avoid artificial sweeteners, acidic foods and carbonated drinks, says the University of Pittsburgh Medical Center. Coffee and other caffeinated beverages can worsen your frequent urination as well, notes the University of Maryland Medical Center. The caffeine in chocolate is also a urinary irritant. Certain foods can stimulate frequent urination; these include oxalate-containing foods like wheat bran, beans, strawberries, spinach, rhubarb, nuts, black tea and beets. Additionally, you should avoid red meats, as well as trans fatty acids from commercial baked goods and fried or processed foods. Other bladder irritants may include citrus fruits, spicy foods, vinegar and fermented foods. In addition to altering your diet, you might consider taking certain supplements to help treat frequent urination. Take a fiber supplement to prevent constipation, a risk factor for frequent urination, MayoClinic.com says. To support your bladder, you might take supplements of acetyl-L-carnitine, omega-3 fatty acids like fish oil, L-theanine, vitamin D, magnesium citrate, calcium citrate or probiotics like Lactobacillus acidophilus, notes the University of Maryland Medical Center. Talk with your healthcare provider before taking any supplements to ease frequent urination. Although you might be tempted to reduce your intake of liquids to ease frequent urination, you shouldn't limit your water consumption. Doing so can cause dehydration, so you should aim to drink filtered water when you are thirsty, throughout the day, recommends the University of Maryland Medical Center. You can, however, make other lifestyle changes to help reduce frequent urination. You could try bladder training, which involves urinating only at scheduled times, says the University of Pittsburgh Medical Center. Performing Kegel exercises, quitting smoking and maintaining a healthy body weight can all reduce frequent urination, MayoClinic.com notes. If you can, exercise moderately for 30 minutes each day, about five days each week. Regular exercise can actually prevent urinary incontinence as well. Keep in mind that there are many different causes of frequent urination, so you must see your doctor for a proper diagnosis and treatment recommendations. Don't rely on dietary changes alone to treat frequent urination, warns MayoClinic.com. Your doctor may prescribe certain medications or therapies for your frequent urination, depending on the exact cause, notes the University of Maryland Medical Center. Work with a healthcare professional or registered dietitian while you're making any significant changes to your daily diet.